I accustom traditional methods like graphite and inks, but after a year from college, using the same techniques, I realized the necessity for practice with other mediums. 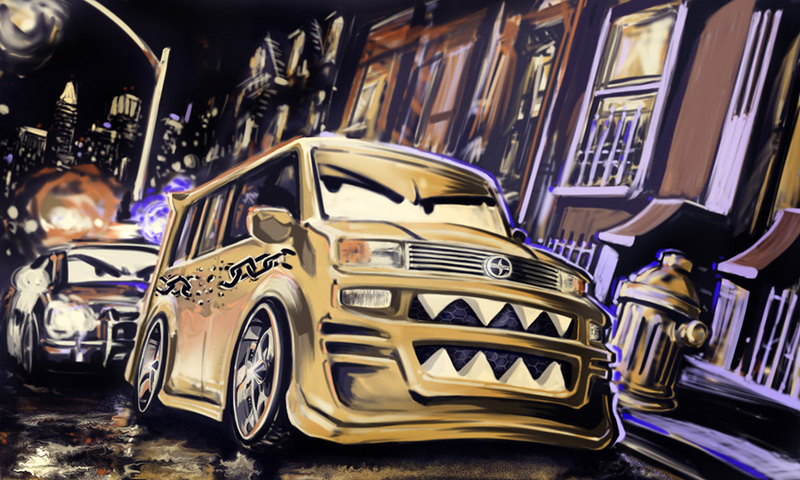 I chose to try a digital medium for a Scion car design contest in 2008. I remembered some years back I did not acceptably agree digital art. I gave it less thought throughout the years and argued digital art was a fraud to traditional artist- a digital product, once completed, is not physically exposed until it is printed. This exposed digital art acceptance imposed digital art as a conglomerate work of the net. Once the internet had it, everyone did too. I reposed digital art. Since digital art is commonplace now, easily it can construe with mediocrity. There is great digital art everywhere; this makes credit of authentication bleak when someone does something exactly similar of another individual. That sounds threatening. Why would I change from pencil to a wacom tablet? In 2008, I had changed my thoughts. I had conformed, I felt. I was tired of my shifty workspaces and I wanted to paint. And at that time I didn’t have the paint or space. But I had a computer. Digital art is a medium, I understand because there is more for me to learn from it. I recalled this scion piece because it made me think about the process and techniques used. Just as I am evolving with techniques so is digital art. This piece has become my inducer. Now, I use digital medium more often as traditional mediums.